Saturday, June 4 is Connecticut Trails Day, and the Branford Land Trust has two family hikes planned. Both events are free and open to the public. We hope you’ll join us. For this June Nature Explorer walk, Lauren Brown will lead us through the Vedder Property to see and identify native plants and flowers. Meet in Stony Creek at the far end of West Point Rd., which is across from the Willoughby Wallace Library. For details, call 203-415-1571. 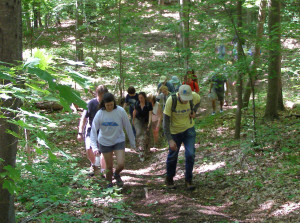 Connecticut Trails Day is actually the largest National Trails Day celebration in the nation. For events happening all around the state, visit www.ctwoodlands.org. PHOTO: Lauren Brown leads a Flora Walk on June 4 in Stony Creek. Photo by Meg Kilgore.